I tell myself that it’s parenting but sometimes it feels more like I’m getting away with the thing I’m telling my kid not to do. “You’re not good at taking no for an answer,” I huff. That was our good-bye this morning. No head buried in my chest for a quick hug. No fingers through hair for a quick fix. No I-love-yous. To anyone. Because my son was so intent on taking five books to school and I was so intent on telling him no. We argued about something neither of us was willing to give in to. I could see the stupidity of it as soon as he walked out the door and what-ifs began racing through my mind. In the quiet morning, I felt too dumb to run out in my pajamas and say, “I love you” to my family. I would forever be ashamed if those angry words were the last ones they heard from me. I was surprised when my kids offered limp waves as my husband’s car rolled away. 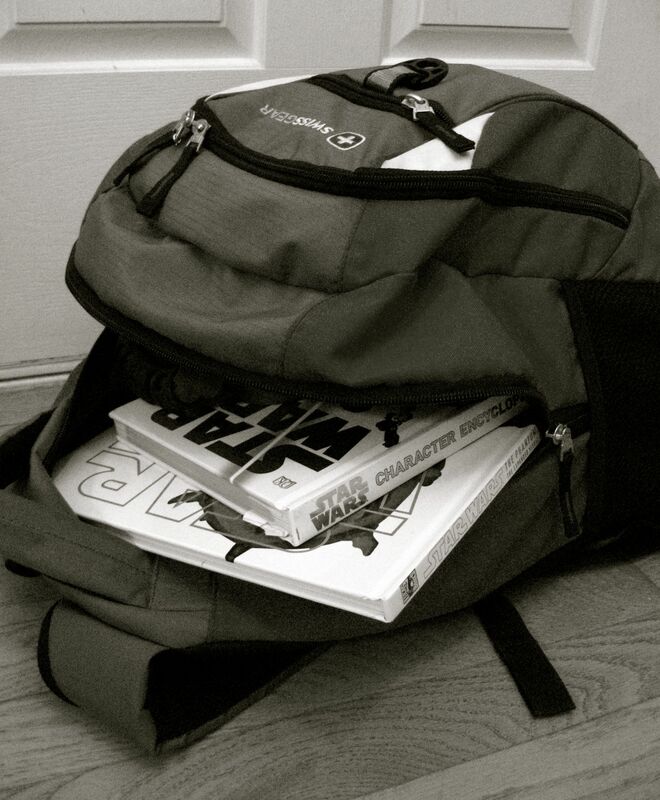 All year we’ve told our son he doesn’t need to take a stack of books to school. His backpack is thick with a school binder, lunchbox, and those reading books. He can’t even get it zipped some mornings. Extending a good foot off his back some days, he resembles the Hunchback and I worry it can’t be good for him. But he needs those books. He needs that fix. One won’t do. He could finish it during the day and then be left without a book to read, the horror! What is a ten-year-old boy to do? It could be worse. I know it could be worse. And I know I have to pick my battles. I just get so frustrated that he can’t take no for an answer that I find myself standing too firm when I shouldn’t be. No triggers a bad reaction in him, probably every kid. I always feel it’s something he needs to work on. But when a kid comes at you wanting a chameleon that will eventually require a 30-gallon tank, or next week bats his blue-green eyes wanting a sweet brown guinea pig with promises to keep it in the bathtub until he saves enough money to buy its cage, you become pretty adept at saying no. You get creative. You point out that his father is the one who feeds his fish most days and didn’t he just get those two months ago for his birthday anyway? You never really say the word no, you just point out the facts. Parenting is full of nos. Maybe I say it too much. Maybe some things can be learned the hard way. I thought a sore back would be the answer to too many books. But I have to stop being so hard on myself. I’m the parent. And when it comes to lizards in 30-gallon tanks, the answer is going to be no. Great post; I can truly empathise! My children are only 5 and 3 and my step son is 2 though so I know it will only get more tricky as I have more excuses to invent! The worst one’s are when they ask for something you say no and they correct you on it as you had previously said no with an excuse and said tomorrow or after dinner etc!!! My neice, who is still a petite person at age 24, injured her back in middle school from a heavy bookbag. Better a “no” than an aching back. I remember those middle and high school backpacks. Maybe he’s just gearing up for the haul. Something I try to do with my daughter, who is 2.5 years, and also hates hearing “NO”, is chance my “No’s” to “Yes”, in a way that I am still the boss. Say she wants to go outside, but I have something else that needs done, I don’t say “no” or “not right now”, which just puts her in a bad mood, I say “Yes, we can go outside after the dishes are clean” or whatever else I need to do. It has defiantly helped her attitude (and mine) when I learned this little tip! I have definitely learned to be more creative with my responses. There is a trick to it some days. As a teacher of ten year olds (and a mom of three pretty well put together young adults), I can tell you that “No” is the most important and least used word in the parenting repertoire! More kids need to hear more “no’s”, that much I know! He’ll learn how to present a good argument, how to be flexible, and how to look forward to his own days as an adult! I clearly remember an exchange with my then 8 year old stubborn as a mule daughter. She said, “I can’t wait to grow up and tell other people what to do! !” Best thing about that: she’s a teacher now!! You did good, Mom! And deep inside, your son knows it! Yes! His classroom has loads of books. But he insists on bringing his own every day. Sometimes he comes home with more. He is obsessed. Not a bad thing I guess. His teacher told me that when they switch classes, he’s the only one who will take a handful with him. It wouldn’t be so bad if these were little paperbacks, but he took two Harry Potters today and tried to take more. Sometimes it’s those big Dorling Kindersley books–two at a time plus a reading book. I try to think about my responses. I try to be fair. I try to stand my ground and not give in once I say no. You’d think it was a bad word. I have a student in my class who is very much the same way! He has the messiest desk in the classroom, because at any time there are at least 4 novels in there with everything else! Every time I hear myself tell him “Stop reading!”, I cringe at myself! But he reads while walking in the hall, he reads in the bathroom (and forgets to come back), he reads while I am giving directions. He’s awesome, and I love him to pieces! Truly. But his backpack weighs more than he does….! Thanks! I can totally relate. My kids are 4 and 22 months. I’m questioning if I can speak any other words. I feel like such a mean mom all the time. I’ve seen kids who maybe don’t hear the word no very much. I don’t want that. But I know what you mean when you feel like you say it all the time. Still, I think it’s OK to say it to things that require a 30-gallon tank. Yes, the forget about all the yeses. I try to remind them of those but then I get eye rolls. Sometimes they keep pushing and pushing unless they hear a big NO. Sometimes it’s the word that gets through. It doesn’t mean they like it. Elyse, you are so clever. I know. I shouldn’t complain, right? There was a time when I had to struggle to get him to read. I’ve created a monster. No! Is a word my children ask a barage of questions when they hear it. For some reason they believe it means maybe and we are up for a long discussion. Many times – it’s a nonsensical tug of war that just leaves me wondering who is the adult. I wonder all the time who is the adult! I think every parents says it too much. Isn’t it the second word they learn when they’re toddlers?! Maybe we should learn how to say no in different languages. At least it would be educational. you can work it into an argument for him to earn a Kindle maybe. Sounds like it would be a good investment… there’s even refurbished ones out now…? Sounds to me like he has a great mom who is paying attention and seeing her child. Nothing wrong with that! That’s a good idea. I wonder if they allow them in school though. This tech stuff is all new territory. My kids backpacks look the same way, especially my daughters. She brings all kinds of nonsense, but I remember, I was the same way as a kid. I would get in trouble for lining smurfs up all over my desk. Yeah, I did get a Care Bear taken away once. Maybe it is that need to have something from home. It was as if you were writing this about MY son! I can so relate. We have had the full backpack discussion a million times! One poster above is so right. Not enough kids hear No. Mom’s No=Love most of the time! I have a little Miss 2 and I started with the whole explaining and reasoning thing. But she just pushes it and pushes it. So now its a resounding NO , if it goes too far. Its my full stop – I am over this conversation isn’t it ? been there. i (try) to say no and then follow it with, i know you’re upset or disappointed and angry with me…. i’m sorry about that.. and i love you..
Im so glad this isn’t just happening to me…… my son is expert at debating and i wonder how much time we spend just going round and round in circles. His stubborn streak comes straight from me im afraid =/ a kindle sounds like a great plan for your boy! I don’t find no too hard to say, practice makes perfect, and with 4 boys I get a lot of practice! Don’t worry about his book obsession, all my boys bring books wherever they go, usual 2-3 choice books, but they have been know do drag their various Star Wars encyclopaedias around ‘just in case’. I am dubbed the Mom of No. I used to think it was the Mom of Know, but my fifth-grader quickly set me straight as I was bragging to his father. Oops. And why is it that boys let the straps of their backpacks all the way out so that the weight of the pack is hitting them in the back of the knees? That can’t be comfortable. Especially when running for the bus. Oh, I love it! It probably only stung a little, right?